Sleep tight and don’t let the bedbugs bite? Seriously, the idea of going to sleep anywhere bedbugs is the stuff of nightmares. These tiny bugs are difficult to see, making detection difficult. Finding early signs of them is essential to prevent a widespread infestation. A basic visual inspection is the cheapest way to begin a bedbug search. Unfortunately, it is also the least reliable, especially in cases of a low volume or early infestation. Turn the lights off in your bedroom and, with a strong flashlight -- 100 lumens is enough, 70 might be enough; but the higher the lumens the better -- examine the bedding, looking at the sheets, comforter, pillows and dust ruffle, one at a time, following every seam with the flashlight beam. Then do the same with your mattress, box spring and frame. You'll have to dismantle the bed to do this, but it's exactly what professionals would do. Look for dark brown or reddish blood spots, about the size of the period at the end of this sentence. Look at the baseboards beneath the bed to see if dead ones are evident. 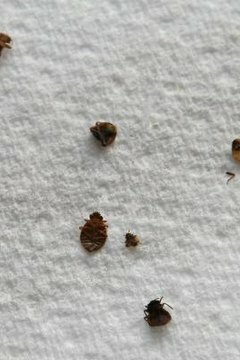 Check your skin for signs of bedbug bites. In people that react to bites, you will see small, red marks, often in a line. They may itch and, in extreme cases, will swell and turn into blisters. Wrists are a common place of bedbug bite occurrence. Because mattresses and box springs contain many crevices where bedbugs can hide, making detection difficult, mattress encasements keep the bedbugs out of these crevices while making infestation easier to detect. A mattress encasement is essentially a large bag that covers and seals both the mattress and box spring, creating a smooth surface, free of seams and cracks where bedbugs hide. Because there are no hiding spaces, detecting bedbugs becomes easier. As you exhale, you release carbon dioxide. Bedbugs detect this carbon dioxide as a sign that a meal of blood is nearby. Creating a carbon dioxide source to attract bedbugs. Commercial detectors are available, but you can make your own version with dry ice, a cooler, a pet food bowl and some talc powder. Use caution when using dry ice. While these devices do trap bugs, they are designed as a form of detection and not a form of eradication. Another option for bedbug detection is the use of specially trained bug-sniffing dogs. Because dogs have far more scent receptors than humans do, they are able to identify the scent released from bedbugs. A well-trained dog has the ability to sniff out a single bedbug or egg with 96 percent accuracy.